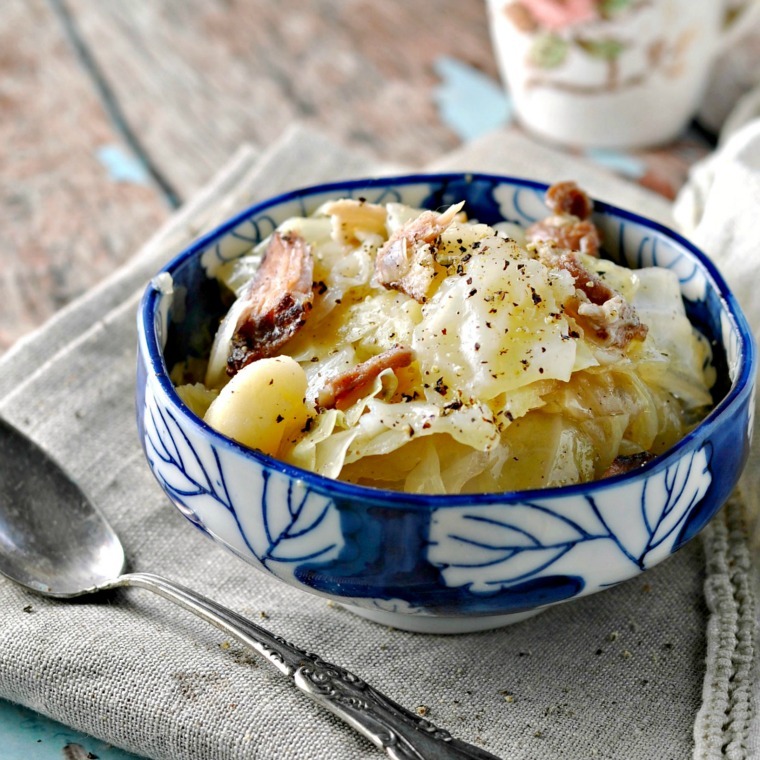 This recipe for Southern Cooked Cabbage is the deep south original cooked cabbage you remember your Mama making. Bacon, Butter, Onion, it’s all in there. melt butter over medium heat on the stove top in a frying pan. Cut the bacon into small pieces and fry in the butter. While bacon is frying, give the onion a rough chop and add to the frying pan. Mince the garlic. Just as the onion is becoming translucent (2-3 minutes), add the garlic and cook until fragrant (smells up the kitchen). Add all of the ingredients (including the melted butter and bacon grease) to a large sauce pot (6 quart or so). Cut up the cabbage as follows: Cut into quarters and then cut into strips that are about 1-2 inches wide (after removing the hard center core) and place into the large sauce pot. Cover the the cabbage with chicken stock – but if not enough stock, add water to cover. Peel three fist sized potatoes and cut into 1-2 inch squares. Add to the stock pot. Add the salt, Tony chachere’s (seaon-all) and pepper. Add the apple cider vinegar and baking soda as well. Cook over medium high heat on the stove top by simmering for 10-12 minutes or just until the cabbage is done (try it to know for sure). You may need to add more salt and/or pepper depending on taste. There is no point in using your good bacon on this recipe, if you can find the “bits and pieces” of bacon (very inexpensive) available at your store, keep some in your fridge/freezer for these kinds of recipes. Perfect inexpensive solution. You know to discard the first couple of outer leaves on cabbage, right? Thought so.